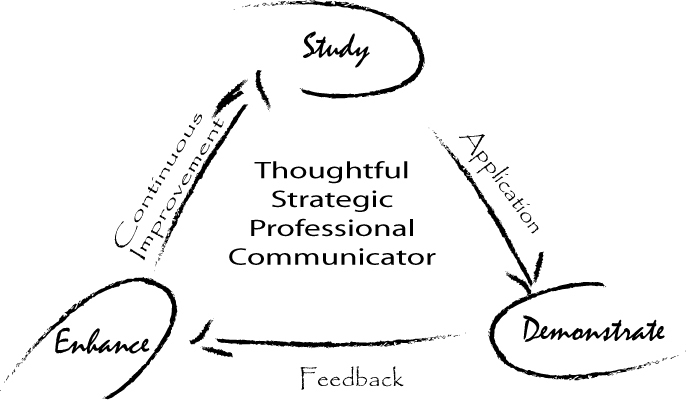 My teaching philosophy is designed to help you become a thoughtful, strategic, and professional communicator. You can do that by studying class material (readings, lectures and discussion), applying what you learned and demonstrating your knowledge in projects, cases or class exercises. After your demonstration, you will receive feedback that you can use to enhance your skills or thought processes. Building those enhancements into future projects allows you to continuously improve (CI). As you continuously improve you will learn to study in a deeper and more productive manner. As you continually cycle through this process, you are simultaneously becoming a more thoughtful, strategic, and professional communicator.